Webmin is a free software that is used by system administrators for system administration and configuration of the system where it is web based. Through Webmin, the system administrator can perform their daily tasks such as system administration and server administration through the graphical web-based interface where it is very easy to use while reducing errors. Webmin very suitable for beginners who do not know much about the unix or linux command line. For future reference, I will show how to install Webmin on CentOS 7/RHEL 7/Oracle Linux 7. Current Webmin version is 1.720. 5. Webmin by default works on port 10000. Access your server on port 10000 using FQDN or IP. Ubuntu 14.04 LTS final just released on 17th April 2014. Ubuntu 14.04 includes 3.13.0-24.46 Ubuntu Linux kernel. In this article i will show how you can install Webmin on Ubuntu 14.04. Webmin is a free program that allow system administrators to perform system administration and configuration via web-based interface. It require less command line and recommended for those who are not familiar with Debian’s operating system as the Ubuntu builds on the foundations of Debian’s architecture and infrastructure. 0 upgraded, 6 newly installed, 0 to remove and 9 not upgraded. Need to get 22.2 MB of archives. Selecting previously unselected package libauthen-pam-perl. Selecting previously unselected package libio-pty-perl. Selecting previously unselected package libapt-pkg-perl. Selecting previously unselected package apt-show-versions. to run commands as root. 4. Finished. Now access webmin by enter: http://serverip:10000/ at your browser. Note : By default Ubuntu don’t allow logins by the root user. However, the user created at system installation time can use sudo to switch to root. Webmin will allow any user who has this sudo capability to login with full root privileges. If you plan to enable root Login on Ubuntu 14.04, kindly follow this steps on How to Enable Root Login on Ubuntu 14.04. 1. If you plan to use RPM version of Webmin, you have to download the file for webmin. 1. Download the Webmin and extract the tar.gz package. Use of uninitialized value in split at /usr/local/webmin/acl/acl-lib.pl line 47. Subroutine setup_ca redefined at /usr/local/webmin/webmin/webmin-lib.pl line 77. Subroutine install_webmin_module redefined at /usr/local/webmin/webmin/webmin-lib.pl line 127. Subroutine grant_user_module redefined at /usr/local/webmin/webmin/webmin-lib.pl line 439. Subroutine delete_webmin_module redefined at /usr/local/webmin/webmin/webmin-lib.pl line 480. Subroutine file_basename redefined at /usr/local/webmin/webmin/webmin-lib.pl line 589. Subroutine gnupg_setup redefined at /usr/local/webmin/webmin/webmin-lib.pl line 603. Subroutine list_standard_modules redefined at /usr/local/webmin/webmin/webmin-lib.pl line 631. Subroutine standard_chooser_button redefined at /usr/local/webmin/webmin/webmin-lib.pl line 663. Subroutine list_third_modules redefined at /usr/local/webmin/webmin/webmin-lib.pl line 676. Subroutine third_chooser_button redefined at /usr/local/webmin/webmin/webmin-lib.pl line 708. Subroutine get_webmin_base_version redefined at /usr/local/webmin/webmin/webmin-lib.pl line 719. Subroutine base_version redefined at /usr/local/webmin/webmin/webmin-lib.pl line 729. Subroutine get_newmodule_users redefined at /usr/local/webmin/webmin/webmin-lib.pl line 740. Subroutine save_newmodule_users redefined at /usr/local/webmin/webmin/webmin-lib.pl line 762. Subroutine get_miniserv_sockets redefined at /usr/local/webmin/webmin/webmin-lib.pl line 786. Subroutine fetch_updates redefined at /usr/local/webmin/webmin/webmin-lib.pl line 834. Subroutine check_update_signature redefined at /usr/local/webmin/webmin/webmin-lib.pl line 901. Subroutine find_cron_job redefined at /usr/local/webmin/webmin/webmin-lib.pl line 932. Subroutine get_ipkeys redefined at /usr/local/webmin/webmin/webmin-lib.pl line 944. Subroutine save_ipkeys redefined at /usr/local/webmin/webmin/webmin-lib.pl line 965. Subroutine validate_key_cert redefined at /usr/local/webmin/webmin/webmin-lib.pl line 997. Subroutine detect_operating_system redefined at /usr/local/webmin/webmin/webmin-lib.pl line 1018. Subroutine show_webmin_notifications redefined at /usr/local/webmin/webmin/webmin-lib.pl line 1053. Subroutine get_webmin_notifications redefined at /usr/local/webmin/webmin/webmin-lib.pl line 1069. Subroutine get_system_uptime redefined at /usr/local/webmin/webmin/webmin-lib.pl line 1271. Subroutine list_operating_systems redefined at /usr/local/webmin/webmin/webmin-lib.pl line 1318. Subroutine shared_root_directory redefined at /usr/local/webmin/webmin/webmin-lib.pl line 1343. Subroutine submit_os_info redefined at /usr/local/webmin/webmin/webmin-lib.pl line 1380. Subroutine get_webmin_id redefined at /usr/local/webmin/webmin/webmin-lib.pl line 1408. Subroutine ip_match redefined at /usr/local/webmin/webmin/webmin-lib.pl line 1424. Subroutine prefix_to_mask redefined at /usr/local/webmin/webmin/webmin-lib.pl line 1519. Subroutine valid_allow redefined at /usr/local/webmin/webmin/webmin-lib.pl line 1533. Subroutine get_preloads redefined at /usr/local/webmin/webmin/webmin-lib.pl line 1591. Subroutine save_preloads redefined at /usr/local/webmin/webmin/webmin-lib.pl line 1603. Subroutine get_tempdirs redefined at /usr/local/webmin/webmin/webmin-lib.pl line 1614. Subroutine save_tempdirs redefined at /usr/local/webmin/webmin/webmin-lib.pl line 1631. Subroutine get_module_install_type redefined at /usr/local/webmin/webmin/webmin-lib.pl line 1650. Subroutine get_install_type redefined at /usr/local/webmin/webmin/webmin-lib.pl line 1667. Subroutine list_cached_files redefined at /usr/local/webmin/webmin/webmin-lib.pl line 1697. Subroutine show_restart_page redefined at /usr/local/webmin/webmin/webmin-lib.pl line 1716. Subroutine cert_info redefined at /usr/local/webmin/webmin/webmin-lib.pl line 1734. Subroutine cert_pem_data redefined at /usr/local/webmin/webmin/webmin-lib.pl line 1775. Subroutine cert_pkcs12_data redefined at /usr/local/webmin/webmin/webmin-lib.pl line 1790. Subroutine get_blocked_users_hosts redefined at /usr/local/webmin/webmin/webmin-lib.pl line 1816. Subroutine show_ssl_key_form redefined at /usr/local/webmin/webmin/webmin-lib.pl line 1844. Subroutine parse_ssl_key_form redefined at /usr/local/webmin/webmin/webmin-lib.pl line 1888. Subroutine parse_ssl_csr_form redefined at /usr/local/webmin/webmin/webmin-lib.pl line 1961. Subroutine build_installed_modules redefined at /usr/local/webmin/webmin/webmin-lib.pl line 2035. Subroutine get_latest_webmin_version redefined at /usr/local/webmin/webmin/webmin-lib.pl line 2077. Subroutine filter_updates redefined at /usr/local/webmin/webmin/webmin-lib.pl line 2110. Subroutine get_clone_source redefined at /usr/local/webmin/webmin/webmin-lib.pl line 2152. Subroutine retry_http_download redefined at /usr/local/webmin/webmin/webmin-lib.pl line 2168. Subroutine list_twofactor_providers redefined at /usr/local/webmin/webmin/webmin-lib.pl line 2199. Subroutine show_twofactor_apikey_authy redefined at /usr/local/webmin/webmin/webmin-lib.pl line 2209. Subroutine validate_twofactor_apikey_authy redefined at /usr/local/webmin/webmin/webmin-lib.pl line 2221. Subroutine show_twofactor_form_authy redefined at /usr/local/webmin/webmin/webmin-lib.pl line 2246. Subroutine parse_twofactor_form_authy redefined at /usr/local/webmin/webmin/webmin-lib.pl line 2262. Subroutine enroll_twofactor_authy redefined at /usr/local/webmin/webmin/webmin-lib.pl line 2277. Subroutine validate_twofactor_authy redefined at /usr/local/webmin/webmin/webmin-lib.pl line 2308. Subroutine validate_twofactor_apikey_totp redefined at /usr/local/webmin/webmin/webmin-lib.pl line 2354. Subroutine show_twofactor_form_totp redefined at /usr/local/webmin/webmin/webmin-lib.pl line 2368. Subroutine parse_twofactor_form_totp redefined at /usr/local/webmin/webmin/webmin-lib.pl line 2382. Subroutine generate_base32_secret redefined at /usr/local/webmin/webmin/webmin-lib.pl line 2398. Subroutine enroll_twofactor_totp redefined at /usr/local/webmin/webmin/webmin-lib.pl line 2412. Subroutine message_twofactor_totp redefined at /usr/local/webmin/webmin/webmin-lib.pl line 2421. Subroutine validate_twofactor_totp redefined at /usr/local/webmin/webmin/webmin-lib.pl line 2435. Subroutine canonicalize_ip6 redefined at /usr/local/webmin/webmin/webmin-lib.pl line 2457. Subroutine list_keys redefined at /usr/local/webmin/webmin/gnupg-lib.pl line 23. Subroutine list_keys_sorted redefined at /usr/local/webmin/webmin/gnupg-lib.pl line 74. Subroutine list_secret_keys redefined at /usr/local/webmin/webmin/gnupg-lib.pl line 82. Subroutine key_fingerprint redefined at /usr/local/webmin/webmin/gnupg-lib.pl line 88. Subroutine get_passphrase redefined at /usr/local/webmin/webmin/gnupg-lib.pl line 105. Subroutine put_passphrase redefined at /usr/local/webmin/webmin/gnupg-lib.pl line 116. Subroutine encrypt_data redefined at /usr/local/webmin/webmin/gnupg-lib.pl line 128. Subroutine decrypt_data redefined at /usr/local/webmin/webmin/gnupg-lib.pl line 167. Subroutine sign_data redefined at /usr/local/webmin/webmin/gnupg-lib.pl line 224. Subroutine verify_data redefined at /usr/local/webmin/webmin/gnupg-lib.pl line 283. Subroutine read_entire_file redefined at /usr/local/webmin/webmin/gnupg-lib.pl line 327. Subroutine write_entire_file redefined at /usr/local/webmin/webmin/gnupg-lib.pl line 339. Subroutine get_trust_level redefined at /usr/local/webmin/webmin/gnupg-lib.pl line 349. Subroutine delete_key redefined at /usr/local/webmin/webmin/gnupg-lib.pl line 371. Subroutine default_email_address redefined at /usr/local/webmin/webmin/gnupg-lib.pl line 398. Subroutine fetch_gpg_key redefined at /usr/local/webmin/webmin/gnupg-lib.pl line 415. Subroutine search_gpg_keys redefined at /usr/local/webmin/webmin/gnupg-lib.pl line 442. Use of uninitialized value $squid::squid_version in substitution (s///) at /usr/local/webmin/squid/squid-lib.pl line 20. Use of uninitialized value $squid::squid_version in numeric ge (>=) at /usr/local/webmin/squid/squid-lib.pl line 295. Use of uninitialized value $squid::squid_version in numeric ge (>=) at /usr/local/webmin/squid/squid-lib.pl line 302. Use of uninitialized value $squid::squid_version in numeric ge (>=) at /usr/local/webmin/squid/squid-lib.pl line 307. Use of uninitialized value $squid::squid_version in numeric ge (>=) at /usr/local/webmin/squid/squid-lib.pl line 312. Use of uninitialized value $squid::squid_version in numeric ge (>=) at /usr/local/webmin/squid/squid-lib.pl line 316. This post will brief you on how to setup Webmin 1.620 using yum repository in CentOS 6.4 virtual private server (VPS). Webmin is an open source system administration and system configuration tool which provide you web-based interface to manage, administer and configure your CentOS VPS or dedicated server through web browser. It’s provide graphical interface remote administration instead of manually edit the configuration using command line from putty or console. 4. By default Webmin runs on port 10000, therefore port 10000 need to be open in order to allow you to access web base interface remotely. Webmin is a open source web-based system administration tool and system configuration tool for Unix servers and services. It’s useful for linux administrator especially the Linux newbies as it can avoid misconfiguration and avoid doing mistake. Webmin can administer other services and server configuration using a web browser remotely. You can setup user accounts, Apache, MySQL, FTP. DNS, file sharing and Etc. 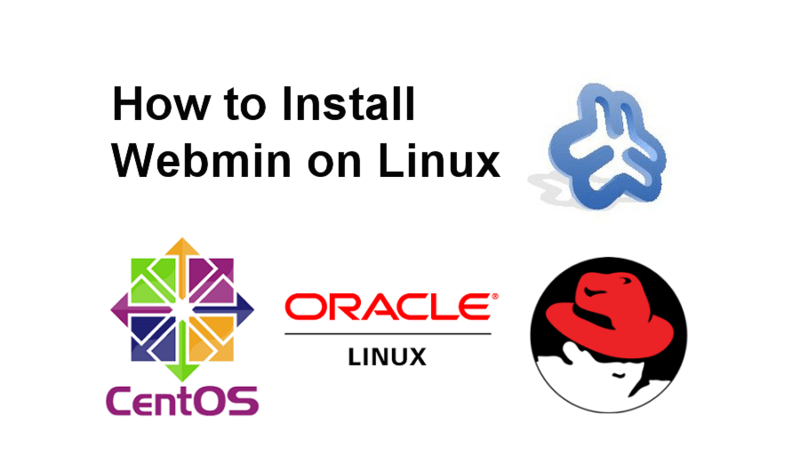 Follow below steps to install Webmin 1.600 on Linux CentOS 6.3 Using RPM package. This article covers the steps on how to uninstall or remove webmin software on linux CentOS and Redhat enterprise Linux (RHEL) and tested work well in any older or newer version such as CentOS 5, CentOS 6, CentOS 7, RHEL 5, RHEL 6, and RHEL 7. Doing a checking for current version of webmin will help you to identify and remove specific webmin package along with the name and version of the package easily. Webmin is an open source program that enables system administration and system configuration through a web interface that is useful for new system administrators. With Webmin, the system administrators can administer user accounts, DNS, file sharing and perform system configuration. This article describes three alternative ways to uninstall or remove webmin software in CentOS or RHEL, but the choice of how to uninstall depend on how the installation has been done in the beginning. Subroutine list_servers redefined at /software/webmin/servers/servers-lib.pl line 92. Subroutine list_servers_sorted redefined at /software/webmin/servers/servers-lib.pl line 111. Subroutine get_server redefined at /software/webmin/servers/servers-lib.pl line 143. Subroutine save_server redefined at /software/webmin/servers/servers-lib.pl line 158. Subroutine delete_server redefined at /software/webmin/servers/servers-lib.pl line 175. Subroutine can_use_server redefined at /software/webmin/servers/servers-lib.pl line 188. Subroutine list_all_groups redefined at /software/webmin/servers/servers-lib.pl line 208. Subroutine logged_in redefined at /software/webmin/servers/servers-lib.pl line 278. Subroutine get_server_types redefined at /software/webmin/servers/servers-lib.pl line 303. Subroutine this_server redefined at /software/webmin/servers/servers-lib.pl line 313. Subroutine get_my_address redefined at /software/webmin/servers/servers-lib.pl line 332. Subroutine address_to_broadcast redefined at /software/webmin/servers/servers-lib.pl line 361. Subroutine test_server redefined at /software/webmin/servers/servers-lib.pl line 375. Subroutine find_cron_job redefined at /software/webmin/servers/servers-lib.pl line 394. Subroutine find_servers redefined at /software/webmin/servers/servers-lib.pl line 407. Webmin is a web-based interface for system administration for Linux. By using webmin at the browser, you can setup user accounts, Apache, DNS, file sharing and much more. 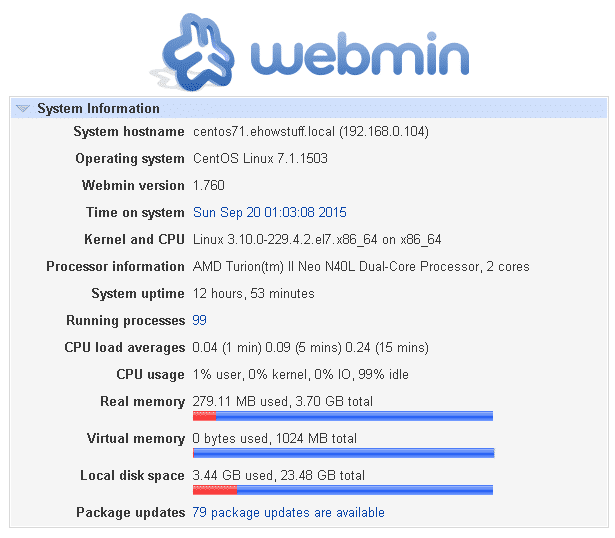 This post covers the steps to setup Webmin 1.590-1 on CentOS 6.3 using RPM. Reusing existing connection to prdownloads.sourceforge.net:80. This quick post will show you the steps on installing webmin, the web-based system configuration and administration tool on linux CentOS 5.8 server. There are three alternative way to setup webmin which using RPM, YUM command and using Tar file. After setup webmin, you will be able to do linux system administration task using Graphical User Interface (GUI) which is good for linux newbie who not familiar with command line. 1. Login to your CentOS server with root privileges. Before downloading Webmin, please make sure that Perl 5 has been installed on your CentOS 5.8. 2. Run ./setup.sh to install the webmin on /usr/local/webmin. This is just an example and the default admin was admin and the password is password. Subroutine setup_ca redefined at /usr/local/webmin/webmin/webmin-lib.pl line 72. Subroutine install_webmin_module redefined at /usr/local/webmin/webmin/webmin-lib.pl line 122. Subroutine grant_user_module redefined at /usr/local/webmin/webmin/webmin-lib.pl line 419. Subroutine delete_webmin_module redefined at /usr/local/webmin/webmin/webmin-lib.pl line 460. Subroutine file_basename redefined at /usr/local/webmin/webmin/webmin-lib.pl line 569. Subroutine gnupg_setup redefined at /usr/local/webmin/webmin/webmin-lib.pl line 583. Subroutine list_standard_modules redefined at /usr/local/webmin/webmin/webmin-lib.pl line 611. Subroutine standard_chooser_button redefined at /usr/local/webmin/webmin/webmin-lib.pl line 643. Subroutine list_third_modules redefined at /usr/local/webmin/webmin/webmin-lib.pl line 656. Subroutine third_chooser_button redefined at /usr/local/webmin/webmin/webmin-lib.pl line 688. Subroutine get_webmin_base_version redefined at /usr/local/webmin/webmin/webmin-lib.pl line 699. Subroutine base_version redefined at /usr/local/webmin/webmin/webmin-lib.pl line 709. Subroutine get_newmodule_users redefined at /usr/local/webmin/webmin/webmin-lib.pl line 720. Subroutine save_newmodule_users redefined at /usr/local/webmin/webmin/webmin-lib.pl line 742. Subroutine get_miniserv_sockets redefined at /usr/local/webmin/webmin/webmin-lib.pl line 766. Subroutine fetch_updates redefined at /usr/local/webmin/webmin/webmin-lib.pl line 814. Subroutine check_update_signature redefined at /usr/local/webmin/webmin/webmin-lib.pl line 881. Subroutine find_cron_job redefined at /usr/local/webmin/webmin/webmin-lib.pl line 912. Subroutine get_ipkeys redefined at /usr/local/webmin/webmin/webmin-lib.pl line 924. Subroutine save_ipkeys redefined at /usr/local/webmin/webmin/webmin-lib.pl line 945. Subroutine validate_key_cert redefined at /usr/local/webmin/webmin/webmin-lib.pl line 977. Subroutine detect_operating_system redefined at /usr/local/webmin/webmin/webmin-lib.pl line 998. Subroutine show_webmin_notifications redefined at /usr/local/webmin/webmin/webmin-lib.pl line 1033. Subroutine get_webmin_notifications redefined at /usr/local/webmin/webmin/webmin-lib.pl line 1049. Subroutine get_system_uptime redefined at /usr/local/webmin/webmin/webmin-lib.pl line 1238. Subroutine list_operating_systems redefined at /usr/local/webmin/webmin/webmin-lib.pl line 1285. Subroutine shared_root_directory redefined at /usr/local/webmin/webmin/webmin-lib.pl line 1310. Subroutine submit_os_info redefined at /usr/local/webmin/webmin/webmin-lib.pl line 1347. Subroutine get_webmin_id redefined at /usr/local/webmin/webmin/webmin-lib.pl line 1375. Subroutine ip_match redefined at /usr/local/webmin/webmin/webmin-lib.pl line 1391. Subroutine prefix_to_mask redefined at /usr/local/webmin/webmin/webmin-lib.pl line 1477. Subroutine valid_allow redefined at /usr/local/webmin/webmin/webmin-lib.pl line 1491. Subroutine get_preloads redefined at /usr/local/webmin/webmin/webmin-lib.pl line 1536. Subroutine save_preloads redefined at /usr/local/webmin/webmin/webmin-lib.pl line 1548. Subroutine get_tempdirs redefined at /usr/local/webmin/webmin/webmin-lib.pl line 1559. Subroutine save_tempdirs redefined at /usr/local/webmin/webmin/webmin-lib.pl line 1576. Subroutine get_module_install_type redefined at /usr/local/webmin/webmin/webmin-lib.pl line 1595. Subroutine get_install_type redefined at /usr/local/webmin/webmin/webmin-lib.pl line 1612. Subroutine list_cached_files redefined at /usr/local/webmin/webmin/webmin-lib.pl line 1642. Subroutine show_restart_page redefined at /usr/local/webmin/webmin/webmin-lib.pl line 1661. Subroutine cert_info redefined at /usr/local/webmin/webmin/webmin-lib.pl line 1679. Subroutine cert_pem_data redefined at /usr/local/webmin/webmin/webmin-lib.pl line 1720. Subroutine cert_pkcs12_data redefined at /usr/local/webmin/webmin/webmin-lib.pl line 1735. Subroutine get_blocked_users_hosts redefined at /usr/local/webmin/webmin/webmin-lib.pl line 1761. Subroutine show_ssl_key_form redefined at /usr/local/webmin/webmin/webmin-lib.pl line 1789. Subroutine parse_ssl_key_form redefined at /usr/local/webmin/webmin/webmin-lib.pl line 1833. Subroutine build_installed_modules redefined at /usr/local/webmin/webmin/webmin-lib.pl line 1906. Subroutine get_latest_webmin_version redefined at /usr/local/webmin/webmin/webmin-lib.pl line 1948. Subroutine filter_updates redefined at /usr/local/webmin/webmin/webmin-lib.pl line 1981. Webmin is a freeware program that provide web-based interface for system administration and system configuration tool for administrators. With Webmin you can setup user accounts, DNS, file sharing and etc. In this post, i will show how to install Webmin on Ubuntu 11.10 server. 0 upgraded, 6 newly installed, 0 to remove and 57 not upgraded. After this operation, 101 MB of additional disk space will be used. Selecting previously deselected package libauthen-pam-perl. Selecting previously deselected package libio-pty-perl. Selecting previously deselected package libapt-pkg-perl. Selecting previously deselected package apt-show-versions.